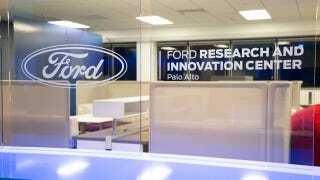 When Ford opened up its first Silicon Valley research center in 2012, it was late to the game. Nearly every major automaker had been in the area for years, with BMW and Mercedes staking a claim in the '90s. Now Ford is getting serious, with a new facility and a 125-person team working right down the road from Stanford. How serious is Ford taking this recent expansion? It didn't just send any suit to cut the ribbon at its new facility in Palo Alto – Mark Fields, Ford's CEO was the master of ceremonies. Fields hit all the recent Ford buzzwords – "mobility," "connectivity," "megacities," etc. – and continued to hype Ford's larger plan to evolve from an automaker into a mobility provider, focusing on everything from car sharing to big data. The lab is one of a few research facilities Ford has around the world, but the proximity to both tech giants and the Silicon Valley knowledge base is key. Part of today's announcement included Ford and Stanford partnering up to expand autonomous vehicle research, with the university testing the algorithms of Ford's Fusion Hybrid test vehicle. Ford is also working with the crew at Nest to incorporate the net-connected thermostat into Sync 3 so it can recognize when the driver is headed home to pre-set the temperature. And finally, a new partnership with Carnegie Mellon's SV branch aims to improve embedded speech recognition when a data connection isn't available. But beyond the partnerships, Ford is looking to attract – and retain – the right people. To do that, it needs to have the same kind of splash and panache as Google, Facebook, Apple, or some up-and-coming start-up. Fields doesn't think that will be a problem, saying, "We're cool enough."